SEO is something that us marketers of small, large and everything in-between organizations, both love and fear. According to HubSpot, up to 90% of traffic originates from search engines, and 64% use search engines to influence their decision when they are ready to buy a product. 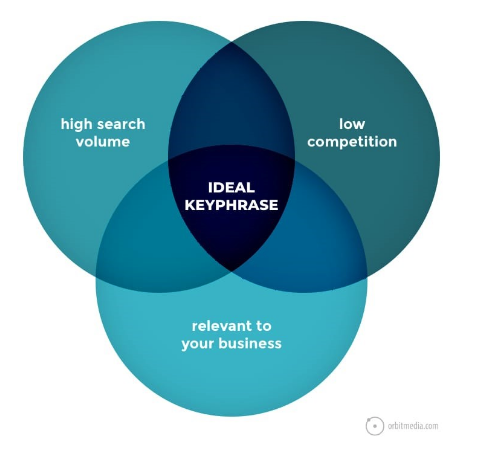 So, we know that we have to nail our SEO strategy and get to the top of the search results in order to speak with these buyers, but how do we get there? Do we pay to be at the top, or do we try to get there organically? While paying will get you quick results, the rewards of being the number 1 organic result are infinite. We had the pleasure of learning from Andy Crestodina, SEO expert and CMO/Co-Founder of Orbit Media Studios, to learn how social media and influencer marketing play an integral part in your SEO success. Is influencer marketing an effective tactic for improving SEO rankings? That’s because it’s the influencers that you need to connect with on social media. These include editors, journalists and bloggers. If they don’t know about your content, they won’t include you in theirs. No mention or link, no authority. No authority, no rankings. And no rankings, mean no qualified visitors and no chance to drive leads. Here’s how the dots connect. 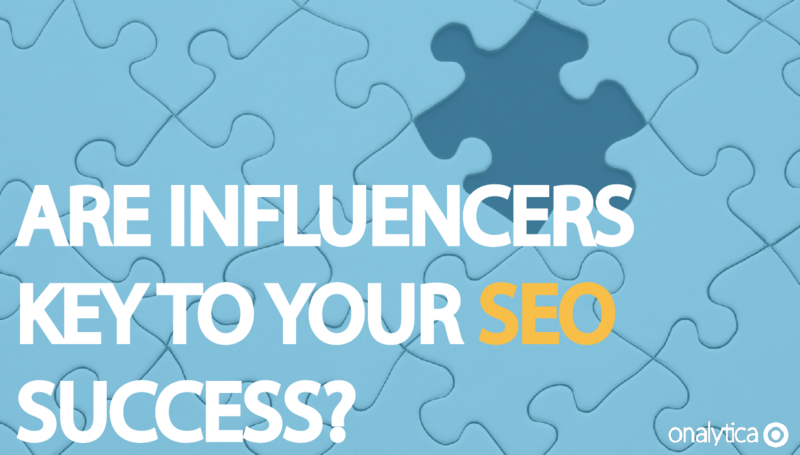 Which influencers drive the best SEO benefits? Think of the editor. An editor is a gatekeeper for an audience. Their job is to keep putting quality content in front of that audience. If a guest writer delivers that quality, the editor shares that audience with them. Think of the journalist. The journalist creates high quality content, delivering value to their readers. If the contributor or source provides value to that audience through insights or a quote, the journalist will include them in the piece. Think of the blogger. The blogger built their subscribers and followers. Their job is to nurture and grow that audience through content and conversation. If a collaborator supports that goal through relevant content and promotion, they blogger gives access to that audience. They create content, so they create links. 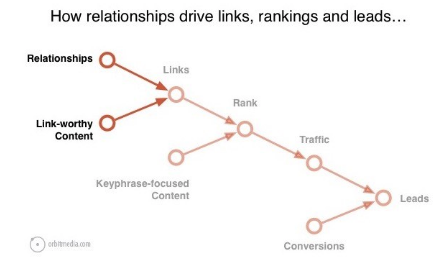 And links to your site are what drives SEO. So even if these influencers have no social followings at all, they may still be very very influential. They’re influential over Google. You need a lot of these relationships, so it makes sense to use an influencer relationship management tool to keep things organized. 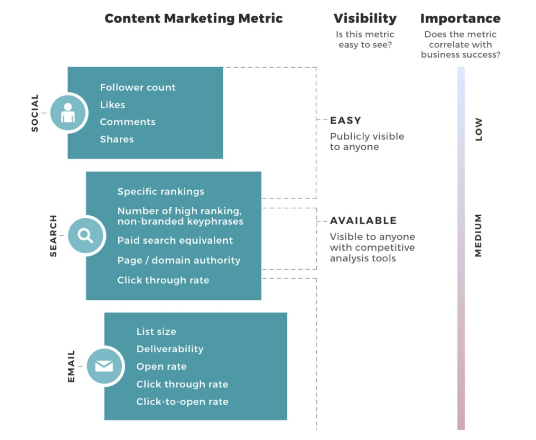 Which SEO tactics do you combine with influencer marketing for best results? If you’re not comfortable with SEO, just start by targeting a full-sentence question. For example, if you’re an office coffee delivery service, you might create an article that targets this question: “What coffee should I get?”. We include them in the article about coffee selection, adding them through contributor quotes or interview questions. Once the piece is live and promoted, we’ll keep in touch with that influencer. Later we’ll suggest we collaborate on a piece for them. This could be a quote from you in their content, or a guest post or interview. If we are mentioned on their site, if that mention links back to our article, it will help our page rank for that “what coffee should I get” phrase. That could mean a ton of traffic over time. Way better than a social media mention. What types of influencer marketing programs drive the best SEO benefits? Contributor quote: Add supportive quotes into the article in just the same way that a journalist would add a source. Make this something you do in every single article you publish. It will do wonders for the quality of your content and the size of your network. Roundup: Send a few questions to a set of relevant influencers, then write a piece around it. Add value by giving your own analysis. The long list of copied and pasted answers is lazy and boring. Interview: Go deep into a topic with a single expert. Give them questions to guide the piece, but give them space and flexibility to add as much value as possible. Syndicate existing content: If they already have content your audience would enjoy, suggest republishing a piece of their content on your site, where it will have new life and reach a new audience. Guest post: Invite them to write a piece on any topic they’d like. Share your guidelines and suggest possible topics, but give them to freedom to create something original. Promote it together. This is all well and good, but do we have examples? Here are two excellent examples of integrating influencers into SEO strategy. Robbie Richards reaches out to dozens of SEO experts and asks them what tools they like to use. He turns their input in a roundup, but it’s also a research piece because he creates a leaderboard. He adds up the “votes” and then puts the most popular tools at the top. 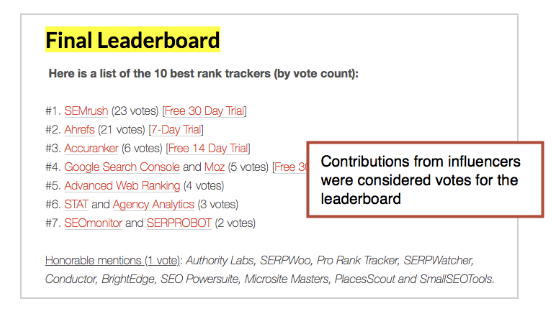 Here’s Robbie’s leaderboard for his Best Keyword Rank Checker article. It ranks for “best keyword rank checker” and the content was all contributions from influencers. It’s very clever because he went beyond getting contributor quotes. He turned their input into data and created a leaderboard! Content marketing is slow. SEO is slow. There are very few shortcuts. But influencer marketing is one of them. The key is avoid the allure of famous social influencers. Instead, collaborate with content creators. Find them, start a conversation, invite them into your content, build a relationship and follow up. If you need help identifying the right influencers that can help you boost your SEO performance, get in touch by clicking the button below.